Conveniently in time for Christmas each year, there always seems to be a film that gathers a starry ensemble cast together to celebrate the holidays and sits back as presumed hilarity ensues; films like The Family Stone and New Year’s Eve fit this mould, as do other similar films that aren’t necessarily festive-themed like This Is Where I Leave You or Valentine’s Day. This year’s offering to the Great Christmas Ensemble Gods of the Sky™ is Christmas with the Coopers – or Love the Coopers, if you’re in the US – and having sat through it, we can safely say that we do NOT want to be spending the holidays with this particular family. This is because the majority of them are the most shrill, self-satisfied and even sociopathic people you will ever come across in a film like this, and yet the film dedicates itself to showing us several scenes of them interacting with one another in the most hateful and snarky of ways while trying to convince us that this is the quintessential family of the holiday season. In several Love Actually-style sub-plots, we see each family member indulging in their own misery and self-pity, but there are too damn many of them to even care about the stupid white people problems they’re going through. First, there’s married couple Sam and Charlotte Cooper (John Goodman and Diane Keaton respectively) who are on the brink of separation because of something about a failed trip to Africa (oh, the woes! ); then there’s Charlotte’s put-upon sister Anne (Marisa Tomei) who gets busted for shoplifting in an attempt to one-up her prodigal older sister; after that, we see Sam and Charlotte’s son Hank Cooper (Ed Helms) struggling with unemployment and his bitter divorce; following that, there’s stuff with their kids that’s probably not worth going into; Grandpa Bucky (Alan Arkin) is striking up a bond with young waitress Ruby (Amanda Seyfried); and finally, in the most ill-advised sub-plot out of all of them, Olivia Wilde’s Eleanor Cooper is convincing soldier Joe (Jake Lacy) to be her imagined boyfriend to satisfy her parents despite her rather condescending and arrogant behaviour towards him (and no, that isn’t intentional). As you can probably gather, there is WAY too damn much stuff going on here, and we haven’t even talked about Anthony Mackie’s cop or Steve Martin’s way-too-intrusive narration yet (by the way, the reveal of the narrator’s identity is just as dumb as it is nonsensical when you start to think about it). However, it’s also really unenjoyable because for some reason, especially in what’s supposed to be a Christmas film, the tone is far too dour and moody when it should at least be a bit more lively and jollier – y’know, tis the season and all that – so a lot of these scenes go by with not many laughs or even a sense of joy, and you’re just stuck there watching these people who you don’t really like all that much being endlessly depressed and not that fun. Lighten up, for goodness sake; it’s Christmas! There’s something in the direction that feels a little off too. Jessie Nelson, whose previous credits include I Am Sam and writing Stepmom among other films, sometimes likes to go for one too many extreme close-ups of people like Olivia Wilde which really take you out of the movie – yes, Wilde has a very nice face, but you don’t have to shove it right down the lens to a point where we can see her breathing onto it – and incorporates some random visual effects shots to “symbolically” represent a person’s feelings (when the narration says how a person felt “shattered”, guess what friggin’ happens) as well as random cutaways that show what an extra is thinking when reacting to a scene involving major characters. It’s weird things like that which lead us to assume that Nelson doesn’t exactly know the best way to really approach what is basically a bunch of weak material thrown together in a festive blender. If you want a pleasant Christmas, then don’t kick off your festive season with Christmas with the Coopers; it feels like a film made exclusively for cynical Scrooges that hate their families, exactly the opposite of what the holiday should be about. 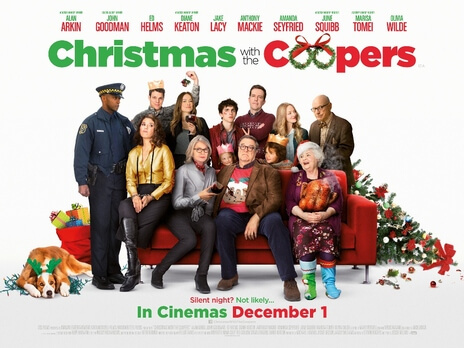 Christmas with the Coopers is a rather miserable stab at the traditional Christmas ensemble pieces, with talented actors playing a largely unlikable family amidst a far-too-drab tone and some weird stylistic choices.